I still remembered the day I got the new Dell 700m, after I made sure that all parts worked properly on MS Windows, I formated the hd and started the journey of Gentoo without any hesitation. IMPORTANT NOTICE: after the initial installation of 2004.3, emerge/emerge -C, overlay, configure/make, at the end, I messed up the portage. I decided to re-install the Gentoo system and integrate the experience in the last year. ATTENTION: PLEASE BE AWARE I AM NOT RESPORNSIBLE FOR ANY DAMAGE TO YOUR SYSTEM, YOU TRY THIS AT YOUR OWN RISK ! Experimental: Stage 1/3 Installation for Gentoo 2005.0 and GCC 3.4.4 to install the basic system, we would note 700m-specific configuration in the following HOWTO. UPDATE: It does not matter since this CFLAGS is used only to build bootstrap the system. For gcc 3.4.3, this is an extreme ambitious CFLAGS, it has been used for almost one year without any problem, except OpenOffice.org. CFLAGS="-march=pentium-m -mtune=pentium-m -O2 -pipe -mmmx -msse -msse2 -mfpmath=sse -fomit-frame-pointer -fno-delayed-branch -fcaller-saves -freorder-blocks -freorder-functions -falign-jumps -finline-functions -frename-registers -fweb -fno-trapping-math -falign-functions=64"
CFLAGS="-O2 -mtune=pentium-m -mmmx -msse -msse2 -fomit-frame-pointer -pipe -ftracer"
LD_FLAGS is disabled since I've met several compilation fail if it is enabled. Everybody has his/her own flavor of kernel, I prefer nitro-sources, 2.6.10-nitro4: The Kernel Formerly Known As Hercules. UPDATE:It is easy to prove that the cpu gracefully scaling consumes less power than the "ping-pong policy, that is the reason we use the conservative cpufreq governor as the default governor, on-demand governor is compiled in the module as the backup. UPDATE: speedfreq is out-of-date, cpufreqd is chose instead. In Dell 700m specification, this machince can be configured as 64 MB shared video memory. Anybody knows HOW? UPDATE: We are going to use intelfb, since it is the developed to support 855GM chipset. After you upgrade your kernel, remember to re-emerge the splashutils. Now, reboot the machine and enjoy the beauty of frame buffer. links would crash in some website, if you can figure it out, please let me know. How to zoom the mplayer's video to full screen? We need run 855resolution before X server lauch. # This is important, otherwise the framebuffer console is messed up when X server exits. How to enhance the performance of X server ? Done. Run two mpg321 instances, if everything is OK, you can hear the dmix of the two songs. And add ndiswrapper to /etc/modules.autoload/kernel-2.6. For ipw2210, ipw2200 users, please check ipw2210.sf.net and ipw2200.sf.net for more details. For Dell 700m user, I suggests i855crt, just as the i810swtich developer says:" i855 users who have flickering problems may want to try the i855crt project to see if that works better." 1 i855crt could setup the resolution of CRT. 2 It eliminates flickering. Very interesting, the CRT works much better in higher resolution such as 1280x1024@75 than 640x480@60. 3 It partially gets rid of the white rectangle in the left top corner of CRT screen. Partially means the "swcursor" sometimes works, somtimes not. I'll try cvs version, and report it later. We can video out in either X or console mode. 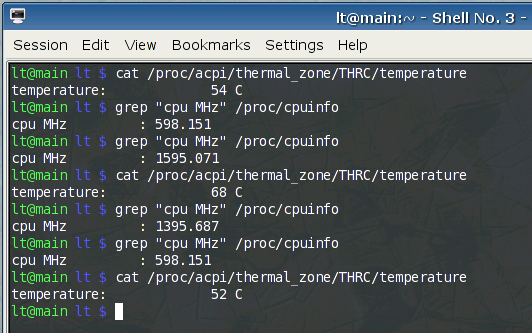 In fact console mode looks very nice, since the screnn just squeeze from 1280x800 to 1024x768. However, in X mode, we have to make a decision between lost of contens or waster of screen. Anyone knows how to span the screen? For example, I could surf the web in LCD, and watch movie full screen in CRT? Does this video adapter support this feature ? I could not test this feature right now. I can not afford the S-Video cable($15!) and the television so far. Thanks to my friend, Dr. Saha, I have the firewire enclosure to test the ieee1394 port. Plugin, the ivman daemon would mount the external HD to /media/something_determined_by_volumn_or policy. I look forward to it, because I've just finished building a system on the same machine. Its a great Idea, lots of people bought these with the dell deals and the 700m seems to have a lot of small issues. I'm just gradually getting done at a snails pace, just finally got sound working, now for finding out about the ndiswrapper!!!! anyone else noticed a small high pitch noise coming from their 700M when booting into linux.. around when coldplug loads.. ? may only happen when on battery, not mains power..
OnResume 20 echo "Welcome back!" bookstack, would you post the "Monitor" section of your xorg.conf please? I used to get thousands of FPS (http://www.linuxfans.org/nuke/modules/Forums/files/snapshot_205.png), but now only get 700, don't know what I did might have caused this. Has anybody gotten the S-Video out working? Does that mean we don't need speedfreq ? Sure, it works with vesafb, vesafbtng, i8x0fb, intelfb. The prolbem is I could not figure it out how to pan the links or mplayer full screen, any idea ? I have met the same problem before, and found if the snd_intel8x0 unload before do_swsuspend, everything works perfectly. I used to get thousands of FPS (http://www.linuxsir.org/bbs/attachment.php?attachmentid=20186), but now only get 700, don't know what I did might have caused this. I can't get mplayer to play full screen either, but unless you can get 1280x800 in framebuffer, full screen won't look very nice anyway. I've tried your hibernate.conf, X crashes as usual. I don't think it's snd_intel8x0 that causes the problem (my own conf actually specifies swsusp2 to unload all the modules), I think it's an X configuration thing, but I can't pinpoint the cause. Anyway, I'm content to suspend from textmode, since I also use XFCE4 often and I think it'll make sense to hibernate after you have started KDE once, because then it'll be much quicker to restart KDE upon resumption. 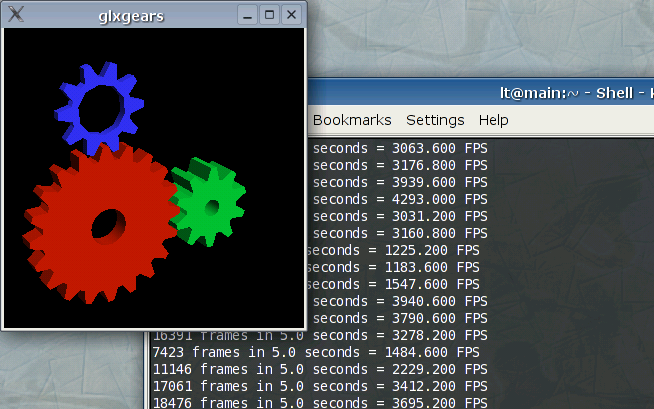 No, I've never installed xorg 6.7 on my Dell 700m, yet I once got much better glxgears result as my screenshot shows (currently about 720 FPS on average). Aaarrrhh, I just don't recall what I did wrong! Could you send the attachment in linuxsir.org? I could not access that site for a long time. and 70 or more full screen. The price is the popup icons in kicker has white background. slightly off topic, I want to put more ram into my little 700M, and am wondering if anyone knows if you can replace BOTH ram simms? ie. is it accessible under the keyboard? or is it soldered directly onto the mainboard? It's accessible, and fairly easily. All you need to do is take the keyboard off the laptop. You can actually find the documentation on Dell's website. It's a regular slot just like you see for the "user accessible" dimm slot. back on topic now, anyone found their touchpad just a bit too sensitive? When I type I find my mouse bringing up someother screen because my thumb has almost touched the pad..
any way to decrease the sensitivity? cause it is mightily annoying! hope to get a chance to play with it soon..
ok I compiled the driver (0.14.0 - well I copied the latest ebuild in teh portage tree to portage overlay and renamed it ..0.14.0.ebuild) and then I compiled the program ksynaptic. restarted X and went into kde control panel, where there is now a device for touchpad under "peripherals"
I'm not too sure it it's all worked, however as I have typed this I have had no problems.. I can now also double click the tap to move windows, and copy text, middle click with two fingers on the pad, and even right click with three fingers on the pad..
re is now a device for touchpad under "peripherals"